You can buy marble with different colors with varying veining degrees. Veining can be regular, subtle, highly variable, or defined. And because every stone is different, make sure you explore the options available for you. Before picking the kind of marble which suits you best, have an idea of the various levels of intensity. 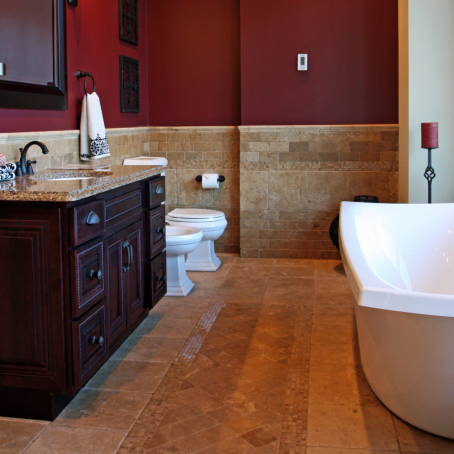 As you choose bathroom flooring, you need to pick a tile which can survive despite high humidity levels. Also, it has to be sturdy enough to withstand heavy traffic. Marble bathroom floors should endure wet conditions, so make sure you select a marble that has a low-gloss to get the results you desire. Polished marble has reflective properties that honed marbles don’t have. Often, honed marble is sealed to reduce damage due to moisture. Make sure you read the recommended applications of the manufacturer since some kind of marble may not suit your bathroom floor. You may have to get the marble tile sealed before grouting. This is meant to protect the marble against possible damage due to dirt, spills, and water. A provider of Stone Maintenance Services will take care of the damage when it occurs. If you have a strong love for everything natural, marble flooring can be the right material for your bathroom floor. Marble has dramatic and subtle beauty depending on the kind of marble you pick and its cut. There are many various stone-cutting techniques that provide different finishes for maximum decorative appeal. Vein-cut: This is meant to improve the look. It can produce a veining pattern that is consistent with the tiles or slab. Cross-cut: This marble is cut at a 90-degree angle. With this type of cut, marble can expose more varieties in patterns that the movement makes. You can find a marble in various colors. A cream or white marble offers your bathroom a peaceful atmosphere. The darker, richer shade gives more sophistication to space. You can also complement the bathroom flooring with coordinating polished marble on the backsplash or countertops. Marble makes a great foundation to your bathroom decor. Explore your options and make a decision based on the considerations above. After picking the best marble bathroom flooring option, remember to add a countertop and backsplash to highlight and coordinate the floor. To learn more about using marble for your bathroom flooring, call Stone Tech at 800-750-7866. We are a provider of Stone Restoration Services in California. This entry was posted in Bathroom Flooring, Decorative Stones, Stone Decoration, Stone Flooring and tagged Pick Desired Color, Preferred Veining Level, Stone-Cutting Strategy. Bookmark the permalink.